Great things to do in the Region of Durham and the GTA in June! You may find more information on events if you go to our facebook page and look in the EVENTS section as events updates keep appearing! This show represents ideas that have sparked from the many diverse interests and experiences of the artist. Every painting is the exploration of a new idea—and a rejection of sameness, evident in the wide variety of subject matter. Carol hopes viewers will find it engaging and learn how to find their own creative sparks. Despite their stature, miniatures have played a huge role in visual culture. In this hour presentation we’ll survey mini artworks and explore how contemporary artists employ model-making, “greebling” and “kitbashing” as a powerful means of expression. Art Show & Sale, original works by local artists. Variety of styles and media. We invite Station Gallery Members to join us for our Annual General Meeting. This talk will provide an overview of archaeological investigations that were undertaken in 2015 in downtown Toronto on the site of a multi-ethnic 19th and 20th century neighbourhood. The excavations revealed the foundations of the British Methodist Episcopal Church, representing the third Black congregation church in the City of Toronto, as well as numerous early Black settler sites. The City of Oshawa is proud to present the 15th annual Peony Festival June 15 and 16, 2019, 10:00 a.m. to 4:00 p.m. This free event displays 300 types of peonies in the gardens and 100's more inside Children's Arena. Visit Oshawa Arts Assoc. booth while you are there. Were the Old Masters “eye-balling it” when they created their highly accurate depictions—or did they have some help? Join SG Curator Olex and artist/educator Todd Tremeer as they explore scientific aids and tools that assisted artists before the advent of photography. Description Art Show featuring 3 friends with 3 different styles and mediums. 60 paintings chosen to hang at McLean Community Centre and the Juror is well known - Allan O'Marra-unafilliated to Ajax Creative Arts. Paintings will consist of People & Animals, Still Life/Flowers, Scapes (Land, Sea or City) and 4 abstract paintings. Included in the show are Best in Show paintings & Honourable mention paintings receiving awards! The awards presentation will be held at the reception on May 29th 6-8 PM at the McLean Community Centre, 95 Magill Drive, Ajax. Refreshments will be served and you can come and meet several artists, enjoy browsing, and view the wonderful artwork. The Latcham Art Centre staff and volunteers will be on hand at the grand opening of the Whitchurch-Stouffville Leisure Centre on June 2, 2018. Get creative and join in our free art activity and talk to staff about the new Latcham Art Centre. Latcham Art Centre will be located at 2 Park Drive, Stouffville ON. For more information or to get involved, our current website is www.latchamgallery.ca or call us at 905-640-8954. Jane LowBeer invites us to join her contemplation on the significance of the ordinary, the quotidian, and the impermanent in The Preponderance of the Small. Her monotypes explore contemporary still-life, making drama out of inconspicuous household items. The artist would like to acknowledge the support of the Ontario Arts Council. Admission is free and all are welcome. Monday: Closed, Tuesday - Thursday: 10am – 9pm, Friday - Sunday: 10am – 4pm. RibFest remains our number 1 annual fund raiser, and its success depends on our wonderful volunteers. The money raised helps us give to all of your wonderful organizations. 12 ~ Pick. Twp. Historical Soc. The Painted Ladies, Margaret Brackley, Kim Johnson, Cheryl Trimbee Del Ciello, Cheryl Bannister, Bonnie Lusty and Irene Leach are back for another Art Show at the Kent Farndale Gallery. We are a group of six Artist friends with a collection of exciting and individual artwork. THE SHADES OF WATER exhibition. It’s all about water! Several members of the Newmarket Group of Artists present their works in a variety of media. Meet the artists: Sunday, June 24 @ 1pm. Dare to Pair (11:30 am to 1:15 pm) Table Feast wine tasting and lunch. What wines go best with Bach? Sommelier Christopher Waters, editor of VINES, has a few suggestions! Join him for a special pre-concert wine-tasting, then choose your favourite and stay on for a delicious lunch prepared by Chef Tina Moorey from On The Side Gourmet. From Campbellford to Versailles – Westben’s Artistic Director & Friends. 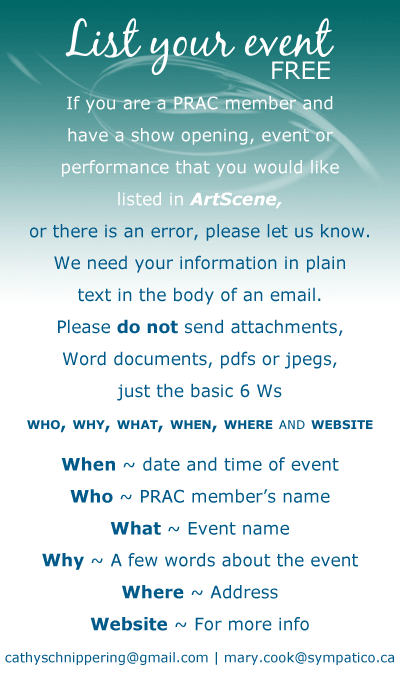 PineRidge Arts Council members are invited to list their events in ArtScene and on the website. Please send plain text, do not send attachments, word documents, pdfs or jpegs to Cathyand Mary or click HERE to enter the info on-line. Please check our members' websites and PRAC's facebook event listings.